Happy Valentine's Day Everyone! To all my fellow Canadians, Happy Family Day! 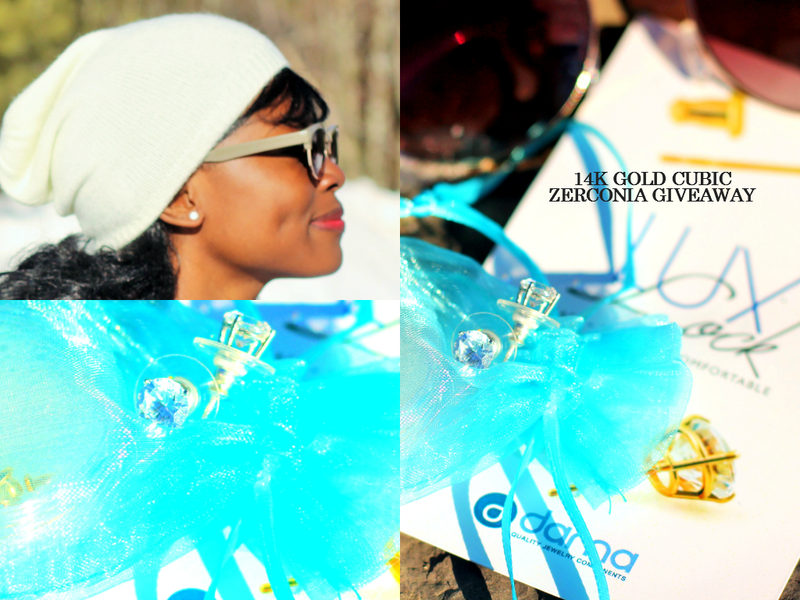 To celebrate this hearts day and because of the love I have for you all, my friends at Dama Jewelry who manufacture the LuxLock, and I have decided to give a lucky winner a pair of 14K Gold Cubic Zerconia Earrings with the LuxLock clutches (a $120 value)! Just like the set i told you all about here. Cosidering how often we lose earrings everyday, who wouldn't want a secure and reliable back lock for their earrings? Wait, wait, that is not all. 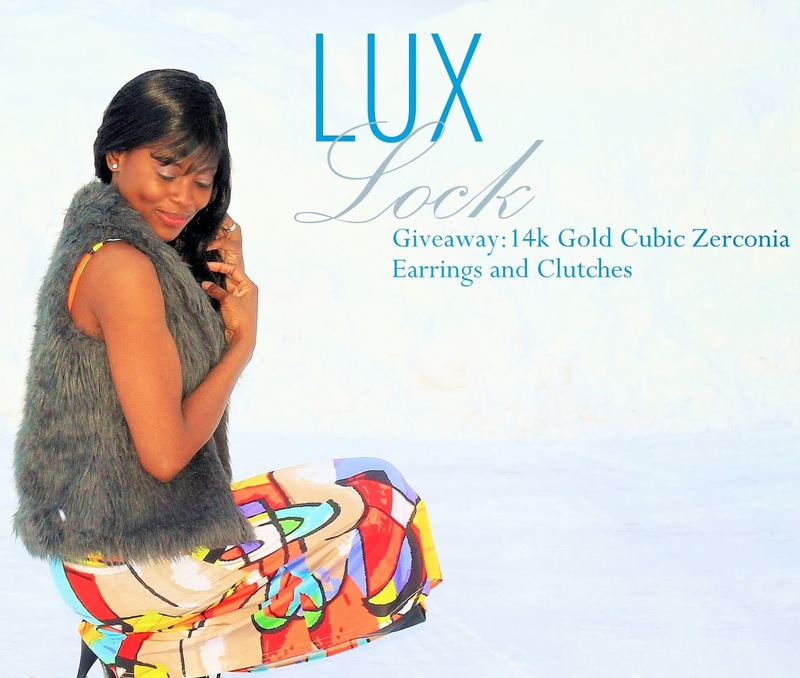 Even if you don't get to win this giveaway, you all receive 20% off your purchase of your own LuxLock. To purchase, just send them an email. Woohoo!! I am really excited about this and i know in my heart you all deserve it. Thanks to my friends at Dama Jewelry. Just a few simple rules and you will be on your way to also owning these classic gems that i am currently so in love with. Yes, it is open worldwide and at the end of two weeks a winner will chosen at random. Thank you all! 1. If you are not officially a friend of The Fashion Stir Fry, you may do so by following on any of these platforms: Facebook, Bloglovin, Google Friend Connect, Twitter, Google+, Instagram Google+ Page and Pinterest. 2. "Like" the Dama LuxLock Facebook Page. 3. Leave in the comment section below, and if you also want, on Dama LuxLock Facebook Page telling us briefly of a time when you wished you had a pair of LuxLock because it could have prevented the loss of a valuable (monetary or sentimental) pair of earrings. So when you get a pair, it will never happen again! 4. Tell your friends, mom, aunts, sisters and more about this lovely company- Dama LuxLock by sharing on your social media platforms or on your blog. Invite them to Like their Facebook Page. The more you share, the better your chances of winning. 5. Finally, please remember to leave your email in the comment section below or their Facebook Page so we can contact you if you win. This Giveaway was updated February 19th 2014 by including a Rafflecopter to keep all entries more organized. If you already entered before please feel free to do so again through the Rafflecopter. Thank you and sorry for the inconvenience. This is a photo of mine in silver that i am wearing in the photo up there, here, here and you are about to see below how i styled it with a colorful dress. I paired the dress with my gorilla faux fur vest and a pair of thigh high boots. I like how the earrings just light up my face. Everyone's crush...lately, top designers' darling and fast emerging fashion icon- Lupita Nyong'o, who can do no wrong was spotted wearing a simple yet so dainty pair of earrings and she looks stunning in them! She is sitting front row next to Anna Wintour, Vogue Editor at the Calvin Klein's Fall 2014 Collection Show during New York Fashion Week 2014. And you know that only means one thing- She's got style! Love is not a big thing but a million little things. Happy Love Day and Family Day (in Canada) !!! Only one question: how does it feel with so little clothes out in the snow? This is Christina from fauxbilicious.blogspot.com. Nice to meet you! You were brave and you won! I love that dress, you look fab in the snow! Hahaha, cold. Awww..Thanks and nice meeting you too. Aww, you are sweet. Thank you. Hahaha, not ice. Just snow. Cold but feels so good. Try it :). Thank you my darling friend :). Wishing you the same. Thank you Kizzy. Wishing you a lovely one too. It was just for a few cold seconds but quite fun, i'll be honest. What a gorgeous dress! You look beautiful doll! Great giveaway! Great outfit! It's really cool! OMG, you look amazing, but aren't you cold????!?!! Doll you are so brave being in that snow taking amazing images and looking gorgeous I know that is not easy looking like the weather feel like summer you are a pro and look always perfect great job thanks for bringing to our attention another amazing item. Enjoy your Valentine's Day and weekend. Gorgeous dress and you are so brave out there. I always admire how you shoot out in the snow with your smile! Hats off to you! Wonderful giveaway girl! Wau...I cant believe! You know as for us - bloggers, we do so much by creating nice pictures even is so cold, or rain but you are standing direct on ice! You pushed the boundaries a bit more forward:-) Brave Busola:-) You look again fantastic, you sweetie. Wish you perfect Valentine´s day as your outfit is. Amazing dress, you are always fab.... snow queen!!!!!!!!!!!!! Wow!! You are one brave girl!! You look lovely as usual. You look amazing and I agree Lupita can do no wrongs. Wonderful colours in the snow, my dear Busola. Ur brave to pose in such snow , it's 14degree where I live and I am in my blanket all day..
You took these pics yourself, wow.. I could have never done this freat job on my own..
You are so break to pose on snow in offs leaves dress..
Loving your jazzy outfit, you bright so much vivacity to any snow filled day! Awesome giveaway, these earrings are classic beauties. Have a wonderful weekend hun! I could have used them when I went to my cousin's wedding! You embody bravery and determination. Anything we put our mind to is achievable including standing barefeet in snow. You go girl! Super cooool blog babe!!! I just started following you on Bloglovin' :-).. I would appreciate it and would love it if you can follow back! love you outfit lovely !! beautiful vibrant dress, and awesome boots! Love the tights too, you look gorgeous as always. I agree CZ or diamonds can really like up your face, although yours seems to do that all by itself ! everytime i go on vacation I lose a pair of earrings! So when I get a pair, it will never happen again! I loose my earrings every year. Always have to buy a new pair. I wish I had these earrings period. I have entered it dear. I lost one of my fav earring during my school time, wish their products were there at that time. i wish i had it when i lost my earrings when i was smaller in school times . those times i was quite neglectful .